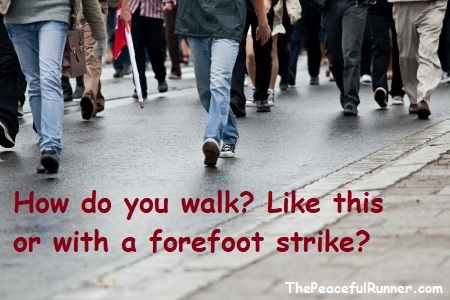 Do You Forefoot Strike While Walking? Welcome to our monthly newsletter -- Do You Forefoot Strike While Walking? We hope you enjoy this article and it inspires you to explore your foot strike while walking. Most of us don't pay any attention as to how our foot lands when we walk, but if we use a forefoot landing while walking, it can have a significant positive effect on how we run. It seems that most people tend to heel strike while walking. Heel striking while walking will cause you to overstride and continuously put on the brakes and jar your body with each step—the same effect it can cause while you are running. Take time to notice how other people walk. If they are overstriding, you can see the entire bottom of their shoe as they walk towards you (as in the picture above). All their weight will rest on their back leg. If you can not see the bottom of their shoe all the way back to the heel, then they are not overstriding. With a forefoot strike, their weight will be over each foot as they gracefully touch the ground rather than jam on the brakes with an abrupt stop each time. Walking with a forefoot strike can be very fluid and graceful if done properly, but there are many other benefits when you walk this way. I try to go barefoot as much as possible (especially when I am at home) to build strength in my feet. I ditched my house slippers over a year ago so even when it is cold, I only wear warm socks around the house. However, sometimes my heels feel sore when I am on my feet a lot so I began to explore how my foot lands when I walk. As it turns out, there is a technique called "fox walking" that is used to promote a forefoot strike while barefoot walking. I have been practicing this a lot lately; not just around the house, but also when I am out walking. It feels really great now that I have mastered the technique. It really does make me feel taller and I am walking faster without any extra effort. It also makes me more aware of how my foot lands when I am running. This style of walking will feel a bit unnatural at first, but as you get the knack of it, you will love it! Try it at home first in your barefeet. As you place your leading foot down, let the ball of the foot come down first with a slight roll inward (the outside by the little toe touches first and then the inside by the big toe). Your heel will then come down and touch gently before the foot springs off again. Slightly raising your heel as you land will help you get the feel for this movement. It may feel like you are sticking your foot out in front but because you are landing on your forefoot, your foot will land underneath your body. Try not to bounce. The movement will feel springy, but it should be smooth and graceful—not bouncy. And don't worry too much about the inward roll. If you find that complicates the movement too much, just leave it for now and try to add it in later. You will still get a good forefoot landing without it. A journey of a thousand miles must begin with a single step." Practice this movement whenever you walk and you will notice an improvement in your running foot strike and perhaps even your running form. You can also take pleasure in knowing that others will not be able to see the soles of your feet while you are walking as you will not be overstriding as so many do. Flat shoes (minimalist shoes) are best for practicing this as your foot is freer to have more movement. I found a great walking shoe for the summer that I absolutely love. It has air vents in the sole, which keep my feet from sweating and they are very comfortable without socks. They have zero heel drop so they are also perfect for practicing fox walking. It is actually a boating shoe, but it is also great for walking. It is the Adidas Climacool Sleek Boating Shoe, which is also available at Zappos.com in styles for both Men and Women. So what about you? What is your opinion on a forefoot strike while walking? Will you give it a try? Have you noticed just how many people overstride when they walk? We would love to hear from you. Please share your opinion in the comments section below. Back to top of Do You Forefoot Strike While Walking?